This easy fajita recipe from Beef Made Easy is a quick dinner the whole family will love. Mix together first 6 ingredients in a bowl. Place steak in a second, glass bowl. Reserve ¼ cup of marinade, and pour remaining amount over steak. Cover, and marinate in refrigerator overnight. Drain meat, and slice into thin strips. Stir-fry meat, peppers, and onion in a skillet over medium-high heat until meat is done. Add reserved marinade as needed to prevent sticking. Serve with warmed flour tortillas. The Ingolds have been farming in Randolph County for generations. In 1990, the family started raising Santa Gertrudis cattle. A few years ago, Patricia Ingold-Wright, who runs the farm with her parents and brothers, realized that many shoppers at the farm’s store on Ross Harris Road in Asheboro stayed away from certain cuts of meat because they were uncertain how to cook them. 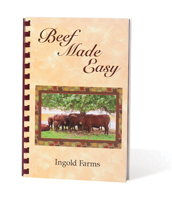 So she published Beef Made Easy, a collection of her family’s favorite beef dishes. The cookbook offers 50 pages of recipes for steaks, roasts, ground beef, stew beef, ribs, and liver, as well as useful tips on how to best prepare different cuts. Cookbooks are available at the Ingold Farms store at 793 Ross Harris Road in Asheboro. Or to order a copy, call (336) 625-8481 or email TLIngold57@embarqmail.com.